The HPE Aruba switches have this cool feature called downloadable user-roles (DUR). DUR enables the switch to use a central ClearPass server to download user-roles to the switch for authenticated users. More and more customers want to implement wired authentication to strengthen the security level of their network. 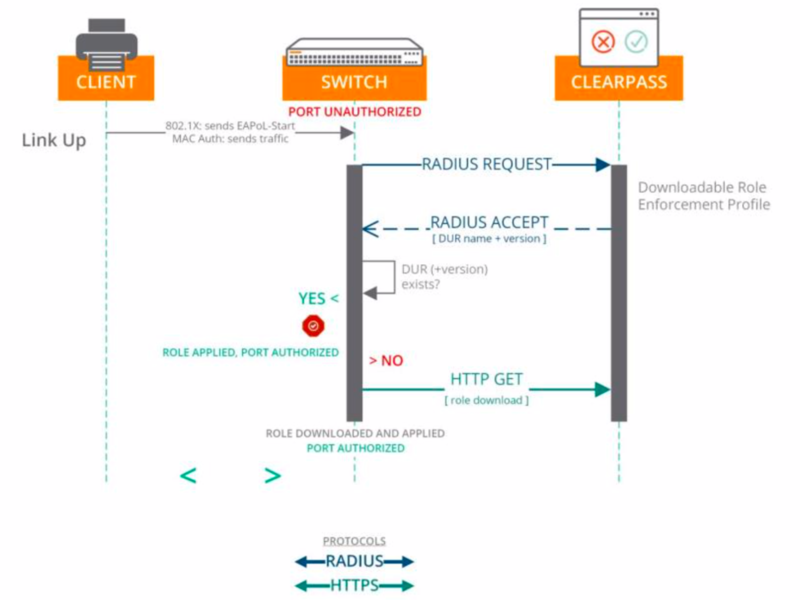 Via DUR the switches perform an HTTPS API request against ClearPass to download the user-role configuration. This makes the configuration of multiple switches easier, because you don’t need to configure the user-roles locally on the switches anymore, but you push them from a central server. The communication between switch and ClearPass is illustrated in the picture below. I won’t describe the whole DUR configuration step-by-step, but below you can find the most important configuration for the switch. For the HTTP GET to work the switch needs to trust the certificate chain from ClearPass. In ArubaOS 16.08 and later the certificate is automatically downloaded when specifying the option “clearpass” when configuring the RADIUS client. Another very important step for DUR to work is NTP time sync. The time on the switches needs to be in sync and here a “problem” arises. After a switch power outage, the switch has to sync its time with an NTP server. And the time needs to be in sync before the first wired clients start authenticating. Even when I use the “iburst option with the NTP server for aggressive polling, I see that the time isn’t always synced in time. Below you see the output from “show log -r” when the client authenticates, but the switch hasn’t synced its time yet. I 01/01/90 01:03:11 04911 ntp: ST1-CMDR: The NTP Server 10.10.1.1 is unreachable. I 01/01/90 01:02:55 00584 WebMacAuth: ST1-CMDR: Port 1/1, re-auth timeout 10 too short. W 01/01/90 01:02:55 05204 dca: ST1-CMDR: Failed to apply user role VOIP___DUR-3005-1_7Z4q to macAuth client 08000F9D45BF on port 1/1: user role is invalid. W 01/01/90 01:02:55 05620 dca: ST1-CMDR: macAuth client 08000F9D45BF on port 1/1 assigned to initial role as downloading failed for user role VOIP___DUR-3005-1. The port is placed in the initial-role which is by default the role denyall. “Problem” with the default role is the missing option “reauthentication period”, so the connected clients will not automatically reauthenticate after an X-period of time. To “fix” this issue I added a new local user-role to the switch and configured this user-role as initial-role. I added the reauthentication period to the user-role, so the clients reauthenticate when time isn’t synced yet and they receive this initial-role from the switch. The configuration of the role is displayed below. To use this role as initial-role you need to execute the following command. Next I tested the role by rebooting the switch. After rebooting I noticed that the switch port is placed in the “reauth-role“, because I receive the error message “assigned to initial role as downloading failed for user role” in the logs. In ClearPass I see another authentication request from the client after X seconds. At that moment the time on the switch is in sync and the switch port is configured with the correct user-role. A software fix for the clock reset on cold boot/power loss issue on the 2930F and 2540 is in the works, and is expected to be released by the end of February.